Dr. Michael Lau at Radiant Rejuvenation & Cosmetic Surgery in the Seattle area offers non-invasive treatments for cellulite. Dr. Michael Lau has developed an expertise in the treatment of cellulite, offering the most up-to-date technologies available to treat cellulite. Our clinic is the first in Seattle and Washington State to offer CelluPulse EPAT (Extracorporeal Pulse Activation Treatment) technology for the treatment of cellulite. Our clinic was also one of the first in the U.S. using VelaSmooth, an energy device using RF, infrared and mechanical energy synergistically to treat cellulite. Cellulite is a common problem in women, with 80% or more experiencing the typical dimpled appearance of the skin caused by fat deposits that are just below the surface of the skin. There are many factors that contribute to the problem of cellulite, so the best approach to the treatment of cellulite is to take into account the causes of cellulite in each individual patient. Dr. Michael Lau has spent time in researching and training in various cellulite treatments and can offer the best solutions available to his patients based on their individual needs. He has spent time with the world authority in cellulite, Dr. Doris Hexsel in Porto Alegre, Brazil to learn the technique of subcision to treat cellulite with deep dimples. Also, using his background in physics, Dr. Lau is an expert in applying the various energy modalities to treat cellulite. He is one of the first in the U.S. to use EPAT shock wave therapy to treat cellulite. 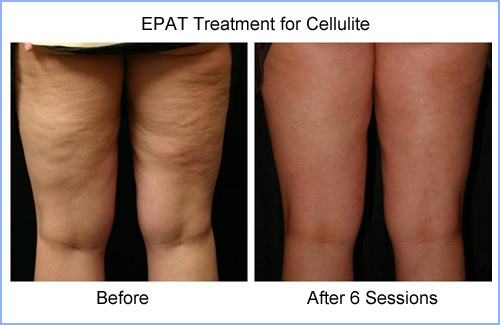 The EPAT technology has been used extensively in Europe with good clinical results in reducing cellulite. The Cellulite Institute and Clinic in the Seattle area is the first clinic in Washington offering CelluPulse EPAT to help reduce the appearance of cellulite. Dr. Lau, a clinical faculty at the University of Washington, has also worked with researchers at the Center for Industrial and Medical Ultrasound (CIMU) of the University of Washington in High Intensity Focused Ultrasound (HIFU) for medical application and investigated the use of shock wave and pulse wave therapy for cellulite. Dr. Lau believes in combining CelluPulse EPAT pulse wave therapy with Thermage radio frequency to treat cellulite, providing patients with the forefront technology innovation to treat the complex problem of cellulite. Using these high tech approaches, augmented with office based minimally invasive surgery that Dr. Lau is an expert in, combined with the understanding of hormone and female physiology, Dr. Lau can provide women with the most comprehensive care for cellulite.